This film’s story comes from an 1839 play by Edward Bulwer-Lytton, he of “It was a dark and stormy night” fame, the man renowned as a writer so bad that there’s an annual bad-writing award named after him. And this story is nothing if not a creaky old potboiler, a romance shoe-horned into a pastiche of various events from the reign of King Louis XIII, combining four different conspiracies against king and cardinal into one. The movie retains the play’s theatrical staginess, with just enough carriage chases and swordplay thrown into it to allow it to qualify for inclusion in this series. 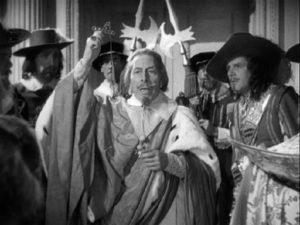 Still, if you’re interested in the period, as Your Editor is, there are several things Cardinal Richelieu gets right, starting with its depiction of His Red Eminence, who is wily, bold, articulate, and as generous one minute as he is ruthless the next. Richelieu is played by George Arliss, an English actor of stage and screen who, though now largely forgotten, was very popular in his day. His characterization of the cardinal is easily the mildest and least menacing of any film portrayal of Richelieu, and it’s jarring at first to have such a milquetoast in the rôle, until gradually Arliss reveals the steel fist beneath the velvet glove. Francis Lister, in the rôle of Prince Gaston, also deserves a mention, as his portrayal of King Louis’s ambitious but weaselly and craven younger brother is spot on. The costumes are all period-perfect, and Maureen O’Sullivan and Cesar Romero, as the star-crossed lovers caught up in the conspiracy, look good in them. But the script doesn’t give them anything interesting to say, and you won’t see anything in this film you haven’t seen many times before. However, it wouldn’t be fair not to acknowledge the capable direction of Rowland V. Lee, without which this old pot wouldn’t boil at all.